Thanks to a relaxing break I’ve had the chance to reflect on what has been a both great year for me and a busy time at It’s a Stitch Up! Being a freelancer now I was able to spend much more time on It’s a Stitch Up – I published three new patterns, including my first ever interactive pattern Mitt-O-Matic, which was a challenging project I’ve had in mind for several years and it was great to finally have the opportunity to develop. I managed to fit in lots of travel including Scotland, Norway and Sweden, where I found a wealth of creative inspiration. Most importantly, after learning more about the wool we knit with, I decided to scale up by small dyeing business and launch It’s a Stitch Up Yarn as a brand, with a mission to make beautiful, ethical yarn available to all knitters. By December I had three yarn lines ready in a capsule range of hand-dyed shades. Taking the plunge into the yarn business was a big investment for me, both in time and money, and I had no idea if it would work out. But, I’ve had a fantastic response already, with several orders and yarn club subscriptions from outside the UK and lovely feedback from customers! In the lead up to Christmas we ran the first It’s a Stitch Up Advent Calendar, with daily competitions, offers and free goodies for Instagram, Facebook and Twitter followers. Thank you for an amazing response! It was wonderful to be able to (virtually) meet and engage with so many crafters around the world. I was lucky enough to also make many new knitting and stitching friends in the real world at the Knitting and Stitching Show and while freelancing for a few months a knitting company, which taught me a huge amount about the industry. Right at the end of the year It’s a Stitch Up became a registered supporter of British Wool Marketing Board’s Campaign for Wool. It means a lot to me to be able to use their labels on our British Wool products and to support British farmers and mills. Somehow, I found the time to do a record amount of knitting; according to Ravelry’s neat feature I turned an eipc 7,500m of yarn into finished objects during 2015. Highlights include my ‘Grettir’, West Knits KAL shawl and my lovely grey sweater. 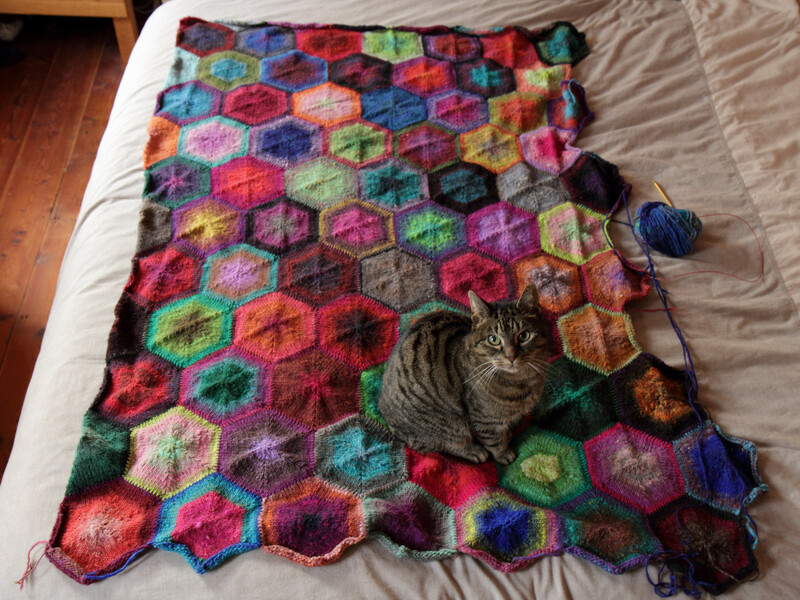 Even my Cerys bedspread is nearing completion. As always, I have a notebook full of ideas and a number of patterns in development and I’m trying to focus on designing for the yarns in our collection (though I am easily distracted!). 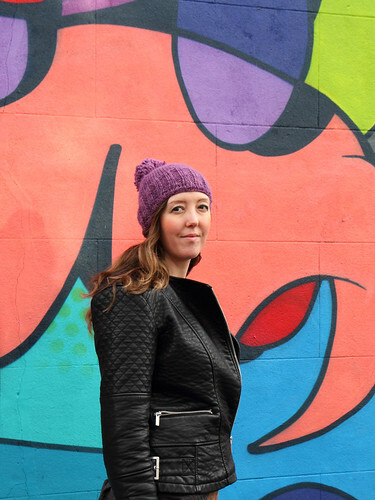 The next pattern will be Hoxton Luxe hat, a more elegant and refined version of the Hotxon Basic, which is a free beginner pattern for our Marshmallow Cloud Alpaca Chunky yarn. There is much dyeing to do! I am continuing to develop new techniques to achieve repeatable shades while maintaining producing what remains characteristically a hand-made product. Although I have found some ‘creative’ ways to dye at a larger scale at home it is definitely a challenge. Right now I am focused on developing the range of shades with a number of different dye techniques, including speckled dyeing and layering by dip-dyeing with dilute solutions for subtle colour effects. Later in the year I hope to be able to expand and develop new yarn lines, and increase the proportion of British wool in the range. With this flurry of activity I am feeling a little out of my depth in areas like marketing and graphic design. Thankfully my friend and talented designer Jovanna is creating new It’s a Stitch Up logo and branding. I can’t wait to give our yarns the beautiful packaging they deserve. I’m putting together the finishes touches on a brand new product that I’m very excited about: Speckled Dyeing Kits. Our kits are an easy introduction to dyeing at home. 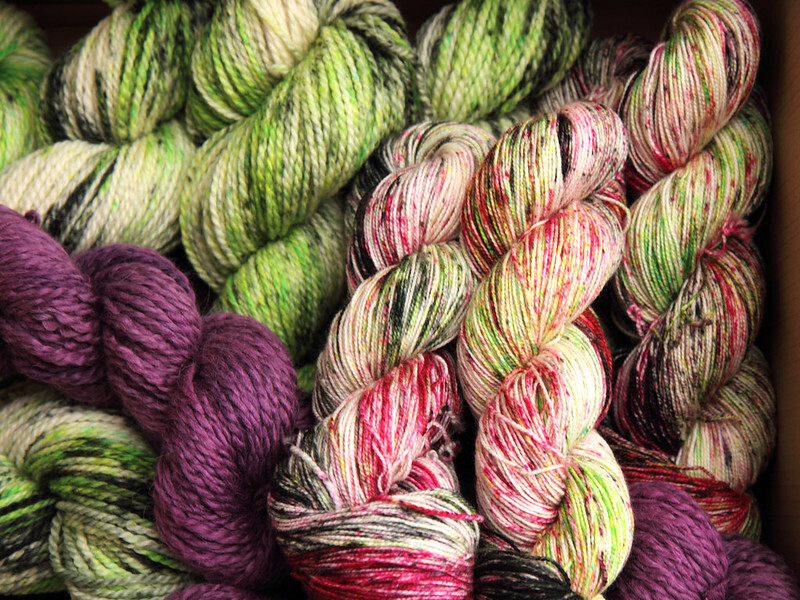 Speckled yarn is both on trend and of the most fun and straightforward dyeing techniques there is. 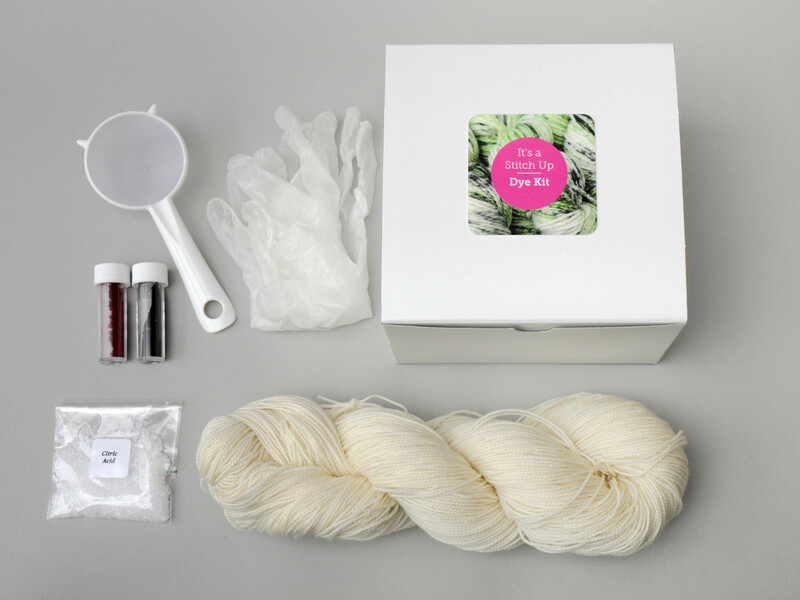 Our kit comes with two dye colours of your choice, yarn and everything you need except for some standard kitchen equipment. I can’t wait to see what you create! Finally, my top priority for new year is to finish this pair of socks, which are now two months late for my boyfriend’s birthday. Oops!